← ‘Tis The Week For Trailers! One thing that was noticed while scavenging Hallmark stores for discounted ornaments were the abundance of Star Trek ornaments. This was unusual, most of the time a fan was lucky to find a spaceship ornament the day after Christmas. Well there are plenty of Romulan Bird-of-Prey spaceships available in several stores. Meanwhile Boba Fett’s Slave I spaceship from Star Wars is impossible to find. That is surprising given that a version of Slave I was released in 2002. The original was heavy and hard to put up on the Christmas tree since its weight pulled down branches. It was painted in blue to reflect that it was the one seen in Star Wars Episode II: Attack Of The Clones and it didn’t have sounds or lights. This year’s model was painted green as seen in The Empire Strikes Back and had sound. Regarding the characters this year, Star Trek couldn’t even compete. 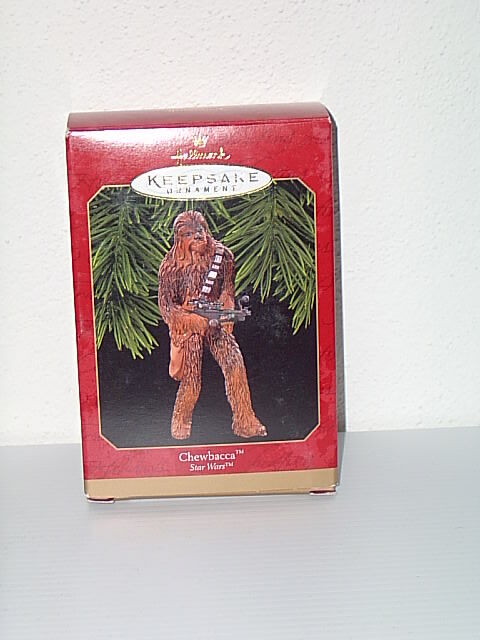 Hallmark released two separate ornaments: one of Spock, the second in their Legends of Star Trek series, and a diorama featuring a scene out of the classic episode “Mirror, Mirror.” With Star Wars, three ornaments were produced, one of Yoda that has sound, a limited edition of Bossk that sold out quickly when released earlier this year and a diorama featuring Han Solo’s confrontation with Greedo. The only one still seen in stores was the diorama and that was in small quantities. So is this further proof that Star Wars is clearly edging out Star Trek in popularity at least when it comes to ornaments? There was a time when Trek ornaments were highly sought after items. The very first Hallmark ornament of the original Enterprise still commands a high price in secondary markets as does practically any Enterprise ornament. Yet some character ornaments and ships are duds. But this year’s plethora of Romulan ships is startling given that even in years when clunkers were released (namely the Borg cube, the Rio Grande runabout, the Scorpion fighter ship and the Vulcan command ship) they were hard to come by after Christmas. The glut of character ornaments isn’t that surprising. When it comes down to it, the Star Wars character ornaments are almost always more interesting and dynamic. Whereas the Trek ornaments feature basically humans in drab poses, the Star Wars characters are very colorful and larger than life. This isn’t meant to revive the old Trek vs. Wars debate, it’s just to point out that there is a disparity between the two franchises lately when it comes to ornaments. 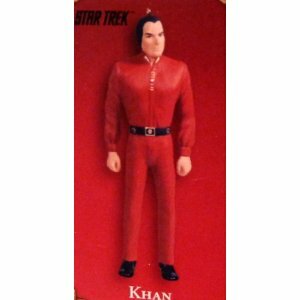 The first Trek character ornaments looked more interesting and featured them in various poses. Like this Spock ornament released in1996. Now ask yourself which makes a better ornament? A better looking gift for collectors? Let’s be clear, Star Trek ornaments are not doomed. It is possible to put out ornaments that capture the fans’ eye. The ship ornaments from the past three years (the Reliant, a Klingon battle cruiser and 2009’s Enterprise) looked fantastic and were difficult to obtain after the holidays. And by looking at older diorama scenes and characters anyone can tell that Trek has plenty of life left in it when it comes to ornaments. Trek has a vast library and history with viable subjects. Star Trek: The Experience in Las Vegas used to sell ornaments featuring aliens from the shows, Hallmark should consider that at least trying the aliens or obscure ships as a limited edition trial balloons or convention exclusives. Here is a list of what Hallmark could produce in the next few years. Add to the list any ship or character introduced in any upcoming film or show. The U.S.S. Kelvin seen from the 2009 Star Trek movie, that’s the ship that Kirk’s father died in by ramming it with the Narada. NOTE: This will be an ornament for 2013. The shuttle crafts and pods seen in Star Trek: The Next Generation. 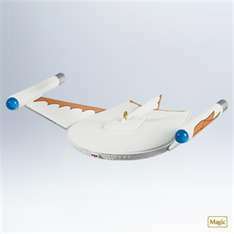 The NX-01 Enterprise, yes they made a metal-plated ornament back in 2002 but it wasn’t lit and too heavy to put on a tree. From Star Trek: Voyager how about Chakotay’s Maquis ship or the Equinox? Tie it in with the anniversary of the show for relevance. For Star Trek: Deep Space Nine, Hallmark could put out the Jem’ Hadar fighter ship or a Cardassian Galor-class ship. The shuttlepod used by Kirk and Scotty to inspect the Enterprise refit back in the first Trek film. The characters should be clearly visible. The Excelsior or Enterprise B, like the Miranda-class ship (most famously represented by the Reliant) this class of ship was often seen in the movies and shows. Other possibilities include Picard’s first command the Stargazer, the Narada, future Spock’s jellyfish-shaped ship from 2009’s Star Trek, a Borg Sphere, the Phoenix from Star Trek: First Contact and even do a mini-ornament set featuring all the known Enterprise ships. A diorama with Spock and his parents from “Journey to Babel” and aliens like Andorians are a must. Harry Mudd or Cyrano Jones (the latter should have a tribble in his hand). A pre-Starfleet Kirk on his motorbike from 2009’s Trek film. Hallmark could consider releasing the original Trek characters like Kirk and Spock wearing their red uniforms from the movies. The red will contrast nicely on trees. 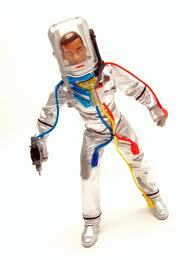 Major characters like Spock or Picard wearing those white spacesuits. A Gorn (or a Gorn vs. Kirk diorama by those famous outcroppings), Gul Dukat, a Jem’ Hadar, or a Borg drone. A view from a runabout or the Defiant bridge with the Bajoran Wormhole on the viewscreen. Lights and sound are mandatory. A diorama depicting the fight on the Narada’s drilling platform where Kirk and Sulu face off against the Romulans from 2009’s Trek. Some kind of diorama featuring the Klingons during one of their ceremonies, there are many to choose from. The first meeting between humans and Vulcans from Star Trek: First Contact. I am truly a Star Wars as well as a Star Trek fan and my 4 foot Christmas tree is home to over 100 of hallmarks Christmas goodies. But sad to say as much of a fan that I am I crave other SCI FI ornaments such as. 6. GI JOE from the 80’s not sci fi but cool never the less. Hallmark would find a great many people interested in such oraments. They could also do one of the Stargate used in the shows, the flying car from Blade Runner and even the TARDIS. Doctor Who has many Christmas-based episodes so it would fit right in. This was a fantastic post. Really loved reading your we blog post. The information was very informative and helpful. I have been collecting startrek for years. Would love to see “the Phoenix” from the Borg star trek movie.